Fort Worth Real Estate Online: Are You An "Empty Nest'er ?" Come Re-build a Smaller Nest in Frisco... and Then Go Shopping ! Are You An "Empty Nest'er ?" Come Re-build a Smaller Nest in Frisco... and Then Go Shopping ! If you are tired of that much-too-large home that you used to need... and want to "Downsize to Luxury"... you need to come take a peek at this exquisite Patio Home in Frisco, Texas near Stonebriar Mall. 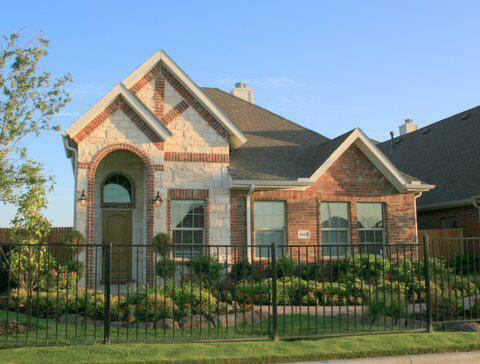 If you're in the market for a new home, and don't want the bother of taking care of a full-sized yard, these Frisco Patio homes may be just what you have been looking for. Ranging in size from 1,650 sq ft to almost 3,000 sq ft, and priced from the high 190's... these impressive and oh-so-energy-efficient homes are just packed with all the custom features that some many of today's buyers are looking for. So... If all the kids are gone... of if you'd just like to travel rather than spend all your time taking care of your larger home... this could be your answer. If you need to be near the Dallas North Tollway or the Stonebriar Complex, this location works about as well as any we have seen. If you are ready to go from "Just Browsing" to "Let's Get Serious..." call the Frisco/McKinney New Homes Hotline at (972) 951-4350... and arrange for your very own personal tour. Nice home Karen Anne, Downsizing is the way to go these days and this one looks like luxury too. Karen Anne, that downsize to luxury term you used is a perfect fit for the patio homes you are marketing. Excellent description. Ricki: Thanks a bunch for your kind words. And yes... lots of luxury features. Now if I could only pick it up and put it on the shores of one of those peaceful rivers you have down in the Hill Country... LOL. Now... if I could only downsize my body... yikes ! Gary: Thanks. I try and do my best to get it just right... every once in awhile. LOL. That's a beaut! I wouldn't mind "down sizing" to that!!!! What a gorgeous home!!!! I'd love to see interior photos. We don't have anything like that up here in Winchester. What an adorable home! I LOVE IT! Man...if I did not have all these kids...and IF I lived in Texas...well...I'd be all over that. Good luck and GBU! Natalie: I will have to take a bunch of interior shots of the model home and post them for you. And yes... I remember Winchester... almost all siding. I miss that "colonial" look. That should put you right around 66 and 81... right ? What pretty country. I lived just east of you from 87 to 93. You didn't call... you didn't write... so I left... LOL. Doing my part to assit you in becoming ActiveRain's newest millionaire. Post © 2019 Karen Anne Stone, Fort Worth Real Estate (New Home Hunters of Fort Worth and Tarrant County). Design © 2019 ActiveRain, Inc. All rights reserved, Inc.